MINNEAPOLIS--(BUSINESS WIRE)-- Target Corp. (NYS: TGT) , 19-time GRAMMY-Award winning producer and entrepreneur Emilio Estefan and Monster are teaming up to introduce premium Sound Machine™ by Monster headphones. The headphones will debut exclusively at select Target stores and Target.com beginning April 14. The Sound Machine™ by Monster headphones are designed with Latin music in mind, capturing the rich, percussive nature of the music. They are available in both on-ear and over-ear versions, retailing at $149.99 and $249.99 respectively. The lightweight on-ear headphones feature controls for the user's phone and music. The over-ear headphones feature plush cushions for noise isolation, as well as DJ-style swiveling earcups and advanced deep bass technology. The debut of these premium headphones is an expansion of the Target and Estefan partnership which was announced last year. "Emilio Estefan is an icon in the music industry as well as the Latin community, and our partnership has been met with great excitement," said Anne Stanchfield, divisional merchandise manager of entertainment, Target. "With the introduction ofSound Machine™ by Monster headphones, we are expanding our relationship to include a product Emilio played a role in creating." "Emilio Estefan's music has been and continues to be a tremendous influence on musicians all over the world," said Noel Lee, head of Monster. "Being able to work with him to create Sound Machine™ by Monsterheadphones has been inspiring for everyone here at Monster, and thanks to our valued partnership with Target, we are looking forward to being able to bring Target guests a new way to enjoy all the music they love, with a unique headphone that epitomizes the heart and soul of Emilio's art." "With Miami Sound Machine, we created a unique blend of rhythms that are synonymous with our culture and our city," said Emilio Estefan. "It has been my dream to create a line of headphones that enhance the quality of sound for people to enjoy these unique rhythms of the world. I am proud to partner with Target in launching Sound Machine by Monster." Expansion of "Emilio Estefan's Picks"
Estefan will also continue to work with Target to curate the exclusive "Emilio Estefan's Picks," a selection of his favorite music, movies and books. This collection will remain prominently placed in the Entertainment department and has expanded to be available in nearly 150 Target stores. Further, Estefan will leverage his strong relationships and music industry expertise to recommend and help create future Target-exclusive Latin music artist partnerships. In addition to the headphones, new to Estefan's latest assortment of "Emilio Estefan's Picks" is the Target-exclusive 2013 Billboard Latin Music Awards compilation album featuring songs by nominated artists, including Gerardo Ortiz, Pitbull, Prince Royce and Yuridia. The album is now available in all stores and on Target.com. Target is the exclusive retail sponsor of the Billboard Latin Music Awards on April 25 in Miami for the sixth year. 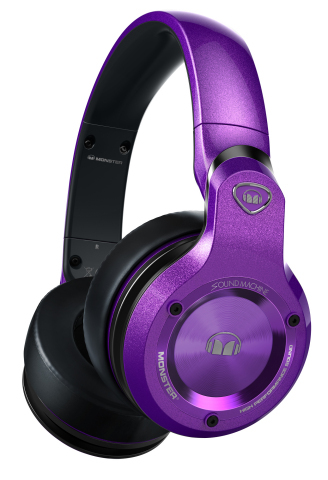 Target is inviting guests at Miami's 2013 Hispanicize Festival April 9-13 to be among the first to experience the Sound Machine™ by Monster headphones prior to their debut in stores. At Target's Hispanicize lounge, attendees can experience the headphones' premium quality via listening stations and have a chance to meet Estefan. Target is proud to be a sponsor of the 2013 Hispanicize Festival, where the retailer will highlight its Latin music partnerships. Minneapolis-based Target Corporation (NYS: TGT) serves guests at 1,808 stores - 1,784 in the United States and 24 in Canada - and at Target.com. Since 1946, Target has given 5 percent of its profit through community grants and programs; today, that giving equals more than $4 million a week. For more information about Target's commitment to corporate responsibility, visit Target.com/corporateresponsibility. Monster was founded over 30 years ago by Head Monster Noel Lee, who was recently honored with the prestigious Plus X Award®: Lifetime Achievement Award, as a company dedicated to creating products that enhance the sound quality of music. The company engineered the sound of the acclaimed Beats by Dr. Dre® headphones, and has become the world's leading manufacturer of high-performance, sonically superior headphones, all of which feature the company's Pure Monster Sound™. Monster is also the world's leading manufacturer of advanced connectivity solutions for high-performance home entertainment, audio, home cinema, computer and gaming as well as a leading innovator in the field of mobile accessories and professional audio. The company also provides high-performance AC power line conditioning and protection products for audio/video systems, as well as energy-saving power products. Monster continues to lead in innovation with over 300 U.S. and international patents and dozens pending, offering more than 4,000 products in over 134 countries worldwide. The article Target and Emilio Estefan Expand Partnership with the Exclusive Release of Sound Machine™ by Monster Headphones originally appeared on Fool.com.